A 30-country survey in late 2005-early 2006 and a 19-country survey in mid 2006 make possible the compilation of extensive cross-national comparative data on public opinion on climate change issues for the G8 and G5 countries. The former study was conducted by GlobScan during October-January, and included a question that had been asked in 2003; the results were analyzed and reported by WorldPublicOpinion.org on its web site at www.worldpublicopinion.org. The latter study was conducted for the BBC during May-July by GlobScan and the Program on International Policy Attitudes (PIPA) at the University of Maryland; its results were reported at www.bbc.com and www.worldpublicopinion.org. Visitors to this web site are encouraged to visit the original sources for further details. The charts below have been created by the author - who is solely responsible for them - on the basis of the detailed results reported on the web sites cited above, as downloaded on July 14, 2006. Charts 1 and 2 have been compiled from data in the first survey noted above and its 2003 predecessor. Charts 3 through 7 have been compiled from data in the latter survey noted above. Overall, the results indicate that strong majorities in all countries consider climate change to be a serious problem, with the level of concern up substantially in nearly all of the countries since 2003. 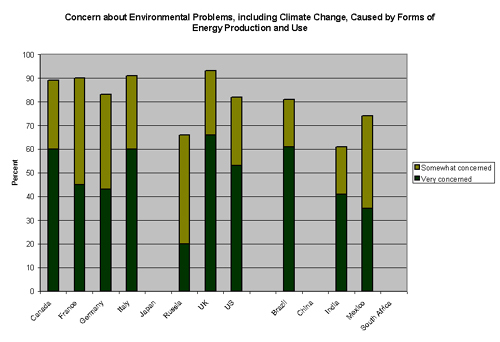 Substantial majorities see current ways of producing and using energy to be problematic. Tax incentives for alternative fuel sources and requirements for increased auto fuel efficiency are the most popular ways to deal with the problem – with widespread support across the countries for these approaches. Support for energy taxes and for nuclear power is less strong and more variable across the countries, with majorities in some countries favoring them, but majorities in several countries opposing them. Although the U.S. public remains somewhat less concerned climate change than the publics in most of the other countries, there is nevertheless a strong majority that now sees climate change as a serious problem. Virtually half (49 percent) of the U.S. population sees climate change as a “very serious” problem. Although a bare majority ( 51 percent) opposes energy taxes, substantial majorities favor tax incentives for alternative energy sources (85 percent), increased auto fuel efficiency standards (77 percent), and nuclear power (63 percent). Chart 1. How serious is the problem? Overwhelming majorities in all of the countries considered climate change to be a “very serious” or “somewhat serious” problem. Only in the U.S. and South Africa did the proportions not exceed 80 percent – with 76 percent in the U.S. and 72 percent in South Africa. The most concern was in Japan, were 98 percent of the respondents agreed that climate change was either a “very serious problem” (75 percent) or “somewhat serious problem” (23 percent). Chart 2. 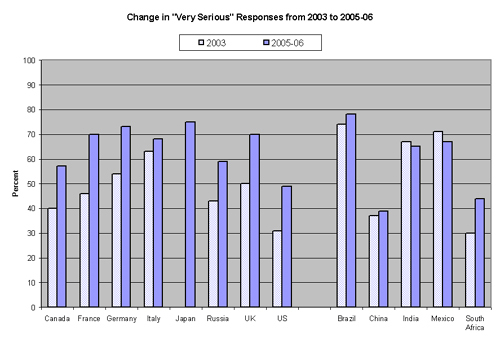 Did perceptions of the seriousness of the problem change from 2003 to 2005-06? The percentage of respondents considering it to be a “very serious problem” increased from 2003 to 2005-06 increased in all of the countries except India and Mexico, where the differences did not exceed the sampling error at the 95 percent confidence level. There was no comparable result for Japan in 2003. Increases of 15-20 percent or more of the respondents were evident in many countries: Canada, France, Germany, Russia, U.K. and U.S. Chart 3. How many people consider the way energy is produced and used to be a cause of environmental problems, including climate change? These results generally parallel those for charts 1 and 2 above (the survey was not conducted in Japan, China or South Africa) – except that only Russia, India and Mexico fall below the 80 percent level. Chart 4. Is there support for energy taxes to encourage conservation? 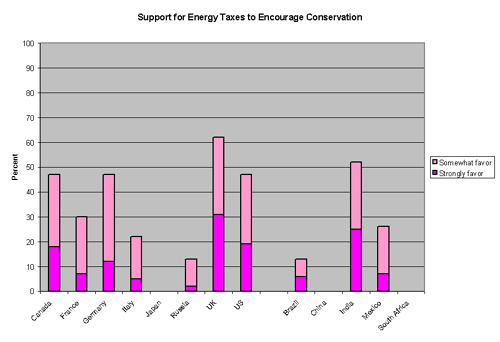 Only in India and the UK is there majority support for energy taxes to encourage conservation. However, close to half of the respondents in Canada (47 percent), Germany (47 percent) and the United States (47 percent) are similarly inclined. In each of these three countries, 51-52 percent were either “somewhat” or “strongly” opposed. Chart 5. 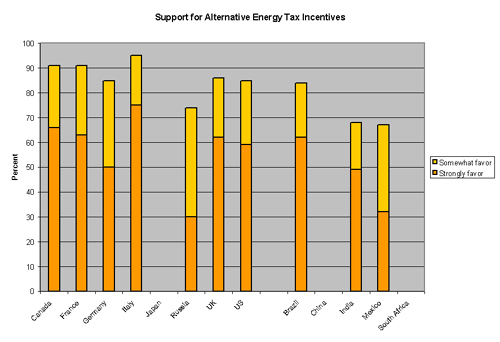 Is there support for tax incentives for alternative energy sources? Two-thirds or more of the respondents in all of the countries support – either “strongly” or “somewhat” – the use of tax incentives to increase reliance on alternative energy sources such as solar or wind. Half or more of the populations of the following countries “strongly support” such measures: Brazil, Canada, France, Germany, Italy, the U.K. and the U.S. Chart 6. 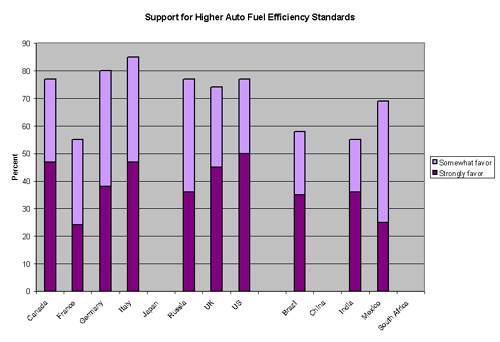 Is there support for requiring increased auto fuel efficiency standards? In all ten of the countries for which there is data, majorities favor increased fuel efficiency standards for automobiles. In six of the countries about three-fourths or more of the respondents have such views – Canada, Germany, Italy, Russia, the U.K. and the U.S. In terms of the proportions that “strongly favor” this measure, support is highest in the U.S. Chart 7. 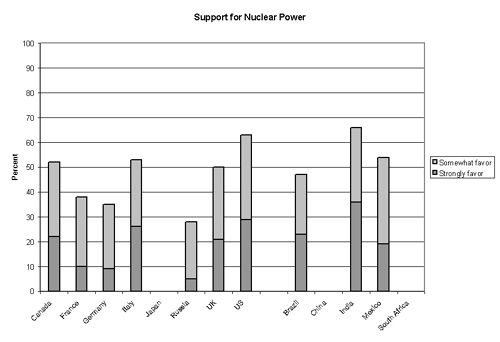 Is there support for nuclear power?